Throw Those Horns In the Air in Celebration of Hellboy's 25th Anniversary! 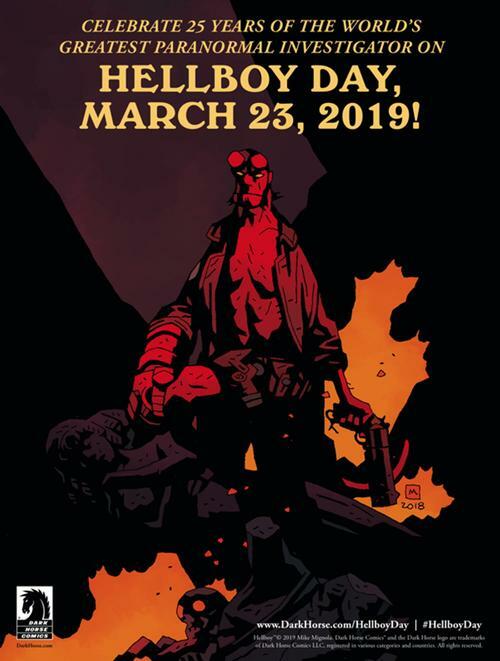 This Saturday, March 23 marks the 25th anniversary of Hellboy and has been designated Hellboy Day across libraries, comic book shops, and bookstores around the world! What's a "Hellboy", you ask? Why he's just your extra-ordinary, lovable, big, red guy with a short-temper, a tail, (filed-down) horns, and the Right Hand of Doom, who has wild adventures fighting Nazis, mad scientists, other-worldly monsters, and the unexplained! Artist and writer Mike Mignola's comic creation has been entertaining readers for a quarter of a century, with the character's adventures having appeared in what is known as the "Mignolaverse"—a strange, shared universe of comic books and graphic novels, comprised of acclaimed titles including the B.P.R.D., Abe Sapien, Crimson Lotus, Frankenstein Underground, Lobster Johnson, The Visitor: How and Why He Stayed, and Sir Edward Grey—The Witchfinder. Dark Horse Comics is throwing a celebration by publishing a 25th anniversary edition of Hellboy: Seed of Destruction issue #1, featuring a new cover by Mignola and colorist Dave Stewart. There was even a pancake and maple syrup-flavored beer released to toast the big red guy on his special day! The hellish festivities will reach a fever pitch when director Neil Marshall's (Dog Soldiers, The Descent, Doomsday, Game of Thrones) forthcoming Hellboy (reboot?) film, starring David Harbour (Stranger Things) as Big Red himself, debuts on screens April 12. This volume sets up the third act and climax of the film, where Hellboy will have an ultimate showdown between Hell and Earth for the survival of humankind. Will Hellboy take up Excalibur and go to war with the Blood Queen and her army of witches, beasts, and a... dragon? Will Hellboy embrace his devilish destiny or fight for his on hellish humanity? Is Hellboy the savior or destroyer of the world? Read (and watch) to find out! 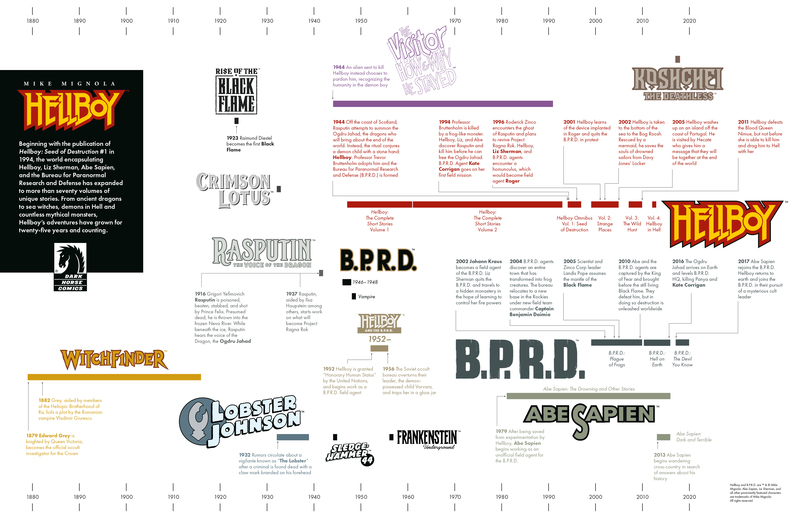 And just so you don't get totally lost or just want to refresh your memory before the new film debut, Dark Horse Comics has created this all-encompassing timeline of the Mignolaverse and Hellboy's place in it. Can't get enough Hellboy and want to read more of his adventures? Browse this catalog list or head over to Hoopla for over 100 Hellboy and Hellboy-related titles! Saturday, March 23, 2019 marks the 25th anniversary of Hellboy and has been declared "Hellboy Day"! 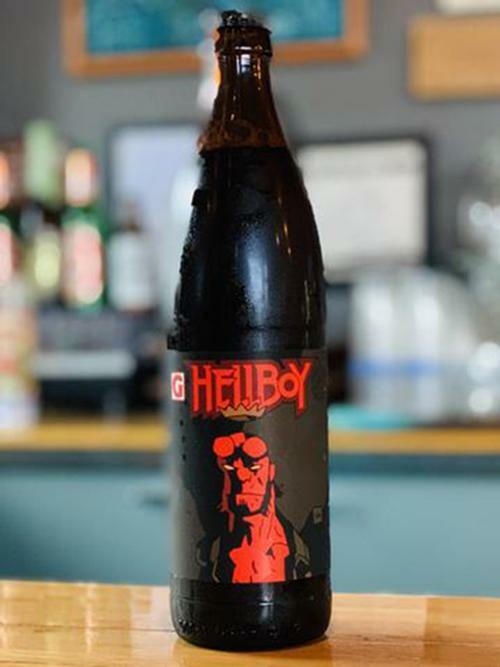 Oregon’s Gigantic Brewing created a special pancake and maple syrup-flavored beer to celebrate Hellboy's 25th. Check out the all-encompassing timeline of the Mignolaverse and Hellboy's place in it! Add a Comment to Throw Those Horns In the Air in Celebration of Hellboy's 25th Anniversary!